Egypt has been able to shed some light on the recent cooperative spirit coming from Turkey. It has been remarked earlier that the agreement between Ankara and Washington for the use of Incirlik airbase to launch airstrikes against ISIS is still at a verbal stage and probably weeks away (source). Now a senior Foreign Ministry official said that..
Now Egypt also accuses Erdo of arming ISIS in Sinai. Not baseless at all. Libya struck a Turkish ship in May near ISIS controlled open sea. TURKEY PM: "ISIS AND PKK COORDINATING AGAINST TURKEY"
This is a patent lie, an indication of the sub standard level the NATO ally has now stooped to. And it is not just coming from a regime spokesman, but from the PM himself. Shameless! Damning evidence was found when US special forces killed Islamic State (ISIS) leader Abu Sayyaf in May, revealing that NATO-member Turkey has in fact been collaborating with the brutal jihadists. The British Guardian reported on Sunday that when Abu Sayyaf’s compound was raided in eastern Syria, it was discovered that Turkey is the main buyer of smuggled ISIS oil which was managed by Abu Sayyaf to economically prop up the terror group. The report quoted a senior Western official, who told the Observer that the findings at the compound showed direct deals between Turkish officials and ISIS leaders is “undeniable.” “There are hundreds of flash drives and documents that were seized there,” the official said. “They are being analyzed at the moment, but the links are already so clear that they could end up having profound policy implications for the relationship between us and Ankara.” “We are at a phase in this war where things that have been in the shadows for a long time are now being exposed to daylight. TURKEY FOUNDING "UNITED TURKMEN ARMY"
A high-level delegation from the Syrian Turkmen Brigades held secret talks in Ankara on Monday to put final touches on a strategy, aiming at developing all armed brigades into a regular Turkmen Army. Sources in Ankara said the talks have largely revealed the final shape of the United Turkmen Army, who will include 5,000 men. (Source) But Kurdish commentators have said this Turkmen army is largely made up of IS, Nusra (and FSA) fighters, that under cover of fighting IS and Assad will attack the Kurdish forces instead. > The most important part of this group’s mission is to fight Kurds in Syria. Turkey wont give up anti Kurd policy. Erdogan has hit on a 3 step plan to get back to absolute power. 1. To conflate the Kurds and the Islamic State as the same bunch of terrorists. 2. Getting the "international community" behind this conflation. Turkey had called an extraordinary meeting of NATO today for this purpose. NATO dutifully complied. (Presser) 3. To disqualify and declare the Kurdish HDP Party illegal on the grounds of its alignment to a terrorist organization. This will open the way for new elections in which Erdogan is to play the nationalist card. If that is the case Turkey and Erdogan are benefiting from chaos and an uptick in terrorism. This is pure speculation, but who knows what plans he has with ISIS. And there's more trouble brewing on the terrorist front. u will see in the next days: some puppets group in Syria attacking Kurds under the disguise of defending Turkmens or Arabs. Jul 25, 2015 Turkish forces have launched airstrikes against Kurdish militants in northern Iraq, an escalation which puts a truce in place since 2013 into question. This may be confusing. So let's connect the dots here. Obama is supporting Turkey's attacks on the Kurdish PKK under the cover of bombing a few empty positions of ISIS. The YPG (remember, those Kurdish forces with the plucky girls?) is the PKK's affiliate in Syria. They have been responsible of liberating Kobane, protecting the Yazidis, and are currently marching on the ISIS capital Raqqa after having cut their supply lines. 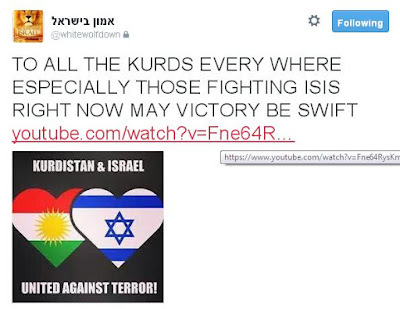 And just to make the alignment clear, this is where the Kurds stand on Israel. Part of the problem is Western versus the Islamic approach to terrorism. Islam has no division of powers. Neither does it make a difference between civilians and the military. Because in Islam war is by definition against unbelievers, civilians are legitimate targets. We in the West call that terrorism. Turkey does not make any difference between the terrorist group ISIS and the PKK, the latter waging a legitimate war against the Turkish state resisting oppression of the Kurds. Their solution, a Socialist state, is equally oppressive. But the PKK affiliate in Syria, the single most effective force against ISIS, has made the transition to a normal, democratic and secular faction. TURKEY: "ISIS AND PKK COLLABORATING AGAINST US"
Turkey and United States agree to clear northern Syria to create "safe regions" there - FM - Wait a mom. It smells and looks like invasion? Turkish PM Davutoglu:"#KRG's president Masoud #Barzani has said operations to ISIS and PKK camps are on reasonable grounds. Davutoglu (MP #Turkije ): er is samenwerking tussen #IS en Koerdisch terreur organisatie #PKK tegen Turkije. Turkish MP Davutoglu: there is cooperation between IS and the Kurdish terror organization PKK against Turkey. And then under cover of airstrikes on ISIS, what many expect to happen, actually happens: while the police are attacking protesters on the ground, the Turkish air force is bombing PKK bases in Iraq. Now: Turkish airstrikes on some areas of Duhok province, Kurdistan region is causing wide wild fire in wooded mountains. RojNews also reports that Turkish jet fighters have also bombed PKK guerrilla positions in Metina, Gare, Haftanin, & Avashin. Pretty much all hell has broken loose. Reports of clashes b/w Kurdish protesters & Turkish cops in a ton of places in the Amed province. Dont be fooled by clash btw turkey and daesh today. All of this is just planned for giving pretext to Erdogan to intervene there. my opinion about the clash btw turkey and daesh near Kilis? a show for preparing turkish public opinion for intervention against kurds. @HananShamounNL @ptrckprk @Kassandra_Troy At least ISIS lover Erdo is not going to have a presidential system or you call that Caliphate. @HananShamounNL @ptrckprk @Kassandra_Troy @cumhuriyetgzt 7. Not only that they are not able to form a government on their own either. @HananShamounNL @ptrckprk @Kassandra_Troy @cumhuriyetgzt They fell 18 MPs short of the absolute majority of a parliament of 550 seats. @Kassandra_Troy @ptrckprk @HananShamounNL using roads in Turkey as the region in between the 2 points in Syria is not under ISIS control. There is plenty of evidence that the Caliphate has no want of supplies. As we already reported, Turkey shipped $1.3 billion in goods to IS through September, the highest nine-month total on record. (Source) That's apart from the rat lines that funnel arms and Jihadists over the border. It's not because the PKK is a terrorist organization; Islam hardly understands the concept of terrorism. And it's not hatred against Assad for being a dictator; the Middle East is full of dictators for the one reason: to prevent political Islam from ever grabbing power. Turkey, IS and the Muslim Brotherhood hate the Kurds, the PKK and Assad because they are Godless apostates! Unbelievable! Turkey shipped $1.3 billion in goods to ISIS through September, the highest nine-month total on record. There's something seriously amiss with the Turkish President Erdogan. He can't for the life of him understand why the coalition is concentrating so much of their efforts on Kobane. Suppose you're a hard nosed, pragmatic, Machiavellian power politician and you're half a psychopath who's incapable of empathy; even then there's still the matter of the symbolism, dealing a vicious opponent (?) a major psychological blow, postmodern optics, an historically oppressed people, and the one chance to score brownie points with that suspicious peace partner and their many friends in the West. What TF is the matter with this man?! He appears to be obsessed with getting the secular Assad out, nothing else seems to matter. While Turkey has finally agreed to let the Meshmerga convoy pass over its territory to Kobane (ETA early hours of the morning), the plan to drop 1300 men of the FSA to fill the vacuum once IS has been defeated, is still on. Foreign Minister Davutoglu explains it on Press TV. (Source) As a matter of fact, this glues very well with another development regarding the FSA: retired US General John Allen may have upgraded the FSA from a military force to a political role. The plot is thickening in the Caliphate Conspiracy with Turkey. Hostility is now no longer a secret, lies and schemes are thick, and Erdogan is trying to split the Kurdisch factions. Once, an isolated coincidence; twice, calls for investigation. Two dead journalists at the Turkish-Syrian border, one dead in a car accident, another shot. While Western Governments try to keep Jihadists from traveling to the battle fields in Syria and Iraq, thereby risking home attacks like we saw last week in Ottawa and New York City (source), MB ruled Turkey has no such compunctions. This case shows how Islamic State does not even have to conquer territory to expand! Here an entire Turkish village volunteered to join the Caliphate. German report how Turkey arms and sends Jihadists into Syria. Yet again more evidence that Turkey is still allowing IS terrorists to cross into Kobane to kill Kurds. Post by Umut bilal gezer Photography. Evidence of Turkey's open hostility is everywhere, yet the West is wearing blinkers. Erdogan can't understand why Americans think Kobane is important and worth fighting for. This tells us volumes about the nature of Erdogan. And more evidence that Turkey serves as what the CIA calls a 'rat line', a back channel highway for the Islamic State. Today more indications have come to light about the position of Turkey in relation to combating the Islamic State. Turkey on Wednesday said only Syrian refugees would be allowed to cross its border to fight jihadists for the mainly Kurdish Syrian town of Kobane, rejecting calls from the West to fully open the frontier. Prime Minister Ahmet Davutoglu told reporters that "those coming from Syria can go back to join the fight" for Kobane, but that Turkish and other nationals would not be allowed to cross the border. We have to consider the ideological basics: Turkey spent decades fighting the PKK, the Marxist party. They are on the terrorist watch list for good reason. Victims of PKK actions can be found all over the country. Add to that the Islamist turn the country has taken over the last decade or so, and it becomes apparent why the Kurds may be seen as a bigger threat than ISIS. As we pointed out before, as a Muslim country Turkey has no fundamental quarrel with the builders of the Caliphate. From the West this all looks very different. The fact that the Kurds emerged from the collapse of the Ottoman Empire as a stateless people has opened the West up to view the Kurds as an oppressed people living on the edge of four countries - Iran, Syria, Iraq and Turkey - under continuous forms of dictatorship at any given time during the last century. Given that the Kurds emerged from post Saddam Hussein's Iraq as the people who made the most of their new found liberty, has made the West very sympathetic to the plight of the Kurds. Their truly heroic stance at Kobane did the rest. These people deserve a huge break. If the Turks insist on maintaining their hostile position while pretending to be an ally, this is going to cost them dearly. Who still had any doubt about the position of Turkey in this coalition, may be persuaded by the indisputable fact that Turkey is now bombing their own "peace partner" and coalition ally, the Syrian Kurds. And here some news about the new Al Qaeda. The point about Syria is, most good guys are fighting in the army of the secularist, Assad. What is left, are various denominations of Islamists, the "moderates" rooted in the Muslim Brotherhood. And another indicator that the FSA are (at least in part) very far from moderate. The Gulf Arabs are playing us for fools. It started with the testimony of Abu Muhammad al-Amriki, who perished Oct. 12, 2014 in the service of the Caliphate. Abu Muhammad al-Amriki was under orders while fighting with Nusra to let arms from Turkey pass to the Free Syrian Army. A very ugly story is taking shape. As long suspected, we are presented with a confidence trick, a false choice between radicals and moderates. It is reminiscent of what was on offer in the interbellum, when the world was presented with two forms of totalitarianism, and ended up having to fight both. The same is true today. There is no radical and moderate Islamism; whatever we do, we'll end up having to fight both. You can't negotiate or live with evil and expect clean hands. As we revealed not long ago, the roots of (at least some of) the FSA is the Muslim Brotherhood**, the ideology of the former President of Egypt, Mohammed Mursi, the Palestinian terror organization that is running Gaza, and Erdogan of Turkey himself. The West is upholding the Muslim Brotherhood as the "peaceful, secular and democratic" alternative to radicals like Al Qaeda and Islamic State. Erdogan, in the meantime on another chess board, is playing faithful NATO member and loyal ally to the West. Erdogan is saying one thing, while doing quite another. This video is showing a Turkish train loaded with 49 tanks, allegedly a transport consigned to Islamic State in Tel Abyad, another contested Kurdish town. The transport was paid for by the Turkish government. Sep 22, 2014 Turkish train carrying tanks and other weapons, consigned to ISIS in Tel Abyad. Reported by Zilan Qandil, journalist from Kobane. Here is some more circumstantial evidence about the game Turkey is playing. It is not at all beyond conjecture that Erdogan is using IS, Nusra and FSA (all or in part) as a vanguard for a reconstituted Caliphate of his own. Notwithstanding the incompetence of this US administration, it is still a good question how come Susan Rice believes she has a deal, allowing the coalition to launch airstrikes against IS from bases in Turkey, which a day later is categorically denied by the Turks? The explanation of the administration is that "the Turks weren't ready to go public with the information". Maybe there's not much more to it than eagerness for good PR. This story broke this morning, which required some sorting out. The upshot is: the Turks have been chasing away the Kurdish forces while IS orcs got a free pass. It's not the first time such behavior has been reported. * Al-Amriki also mentions the following receivers of the Turkish armament shipment: 1- Muhajerin: foreign Jihadists. 2- the emir of Al-Nusra. 3-Abo Allayth: an unknown person, probably aligned to IS.